Ahead of the Standing Committee CITES meeting in July, a number of documents have been circulated. One is SC65-42-01 . This is the report on the status of elephants, poaching levels and illegal trade. One of the monitoring mechanism for African Elephants is PIKE. This uses several indicator-sites through African range states to estimate the poaching rates of elephants. Elephant populations have an intrinsic growth rate of around 5%. hence, in general terms, this means if poaching rates are below 5% then this is sustainable. Elephant populations will still increase (assuming habitat isn’t lost). This doesn’t mean that the increase will be uniform. One of the pressing issues with elephant poaching is that it is unsustainable in some regions. For most of the last two decades however, the increases in Southern and Eastern African range states have exceeded the losses in Central and Northern African range states. 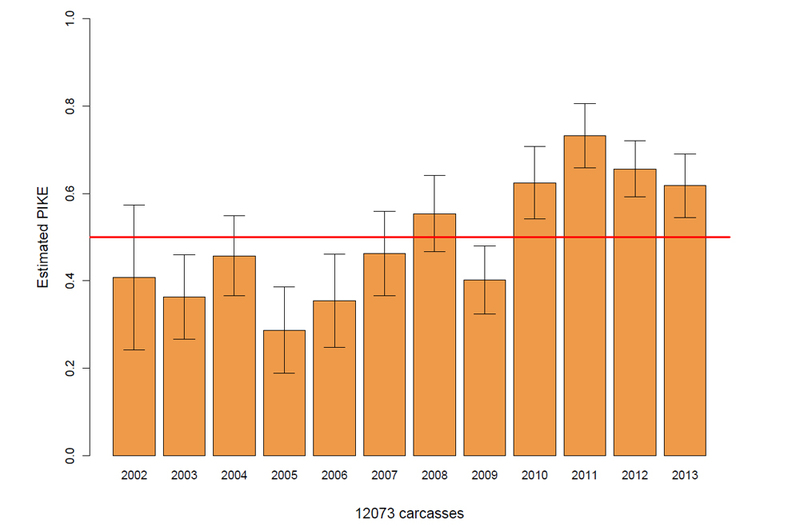 The latest PIKE data shows that the estimated poaching rates peaked in 2011. They have actually been in decline since then. They have not dropped below unsustainable levels as yet, but the track is encouraging. I’ve added Figure 2 from the report below. The vertical axis is the poaching rate, with the 5% line shown in red. The 95% confidence intervals are shown at the top of each bar, in the bar graph. This shows that the decline seems to have set in. I think there are some grounds for optimism. The first is that over 40 tons of raw ivory were intercepted in 2013. That has to hurt the bad guys. That is a sizable chunk of their trade that they have lost. A business model where you are bleeding millions of dollars of stock to law enforcement has got to be causing pain. So there may be a reduction in traffic as the bad guys try to work what to do next. The second is, I think the evidence supports a stockpiling explanation for the poaching increase. It is a mistake to think of ivory as primarily a consumption-good. It is an investment good. The bad guys have been stocking up big, probably because a lot is on offer from Central African range states and the means to get it out (low shipping costs) have coincided. The thing is, this won’t continue indefinitely. If there’s an optimal size for this stockpile (for economic reasons) then once the bad guys have got it, they won’t want to keep adding at the same rate. If you’re sitting on a pile of tusks that could last you maybe 15-20 years, adding more to go to 25, or 30, is starting to look costly (and risky). Their appetite for ivory one hopes, should be sated. It’s going to be premature to bring out the champagne glasses just yet, but we may yet dodge the dire predictions.